OK, that’s not exactly what this new Pew poll shows. But it does indicate that a healthy plurality “get it” when it comes to government spying on journalists. Criticism of the DOJ is substantially higher among those who are paying attention to the story. 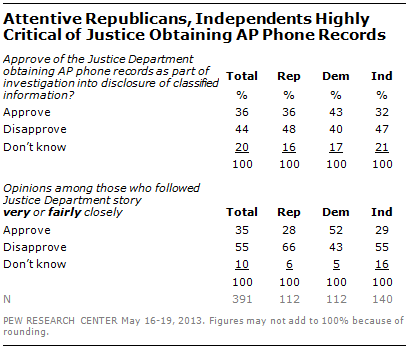 By a 55% to 35% margin people who have followed reports about the AP phone records at least fairly closely disapprove of the DOJ’s actions. Attentive Republicans are particularly critical: they disapprove by a 66% to 28% margin. The much clearer takeaway is that approval is very dependent on political party–unless you think that if the president were a Republican, that the majority of Democrats would nonetheless approve of the actions. It is also another example of where the anti-Obama message has been much more loudly, frequently and effectively stated than the administration’s defense, as here the mainsteam media have joined the usual anti-Obama media. “Criticism of the DOJ is substantially higher among those who are paying attention to the story”–a much more accurate summary is: “Criticism of the DOJ is substantially lhigher among Republicans and Independents–BUT SUBSTANTIALLY LOWER among Democrats who are paying close attention to the story”. This strongly suggests that those most closely following the story are vrey partisan Democrats and and Republicans; the independents are likely a mixture of those too conservative to willingly call themselves Republicans (such as some Tea Party members)and strong Libertarians and those too liberal to willingly call themselves Democrats.